Procrastination is an easy but bad habit. It can be a relief in the moment to say, “I’ll do that tomorrow,” but often, tomorrow doesn’t see it happen, either. Procrastination is the enemy to beat when you’re trying to form healthy habits like regular running. 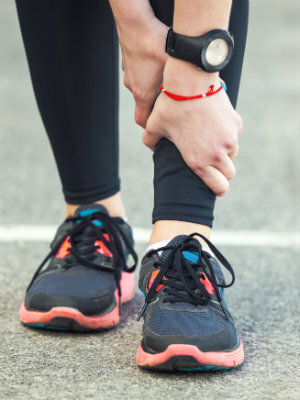 Unfortunately, common running injuries like shin splints can make running painful, giving you another excuse to procrastinate. If you know you’re prone to shin splints, or you’re concerned about shin pain, now is the time to head it off so it can’t become a reason to procrastinate. Shin splints are an overuse injury that develops when you change something in your routine and your lower limbs aren’t conditioned for it. When you suddenly increase mileage or the intensity of your runs without conditioning, you can end up with inflammation and swelling in your shins. Worn out shoes or faulty biomechanics can stress your lower legs as well. Take time to adjust to running surfaces – If you’re switching from a treadmill to the road, or road to dirt, or anything else, your feet have to adjust to new surface pressure. Decrease your distance and speed, then take time working your way back up to your normal routine. Wear the right shoes – Make sure your running shoes aren’t worn out and that they fit correctly for your biomechanical needs. Get support for overpronation – If you know you overpronate, try motion control shoes or special orthotics to support your arches and reduce shin-stressing abnormal motion. Make all changes gradual – This is particularly important when you’re trying not to procrastinate: take your time. If you want to run at all, or run faster/farther, make small changes over time to condition your feet and build healthy habits. Shin splints are a too common running injury that can keep you from building running habits. It’s hard enough to overcome procrastination on its own—adding an injury to the mix just makes it worse! Don’t let shin splints get in the way of your run. Instead, let Absolute Foot Care Specialists help you take care of your lower limbs before pain strikes. Call (702) 839-2010 or use our online forms to request more information or a consultation today.